Asparagus Soup, Thyme for Cooking spring, gourmet first course. This is a lovely soup for late spring. I like to make it earlier in the day and serve it chilled, but it's equally good served warm. You can use milk or cream in place of some of the stock for a creamier version. Trim asparagus and cut into 1" (2.56cm) lengths. Reserve 2 - 4 tips for garnish. Heat butter in medium saucepan. Add onion and sauté until tender and transparent, about 5 minutes. Add asparagus, potatoes and stock. Bring to a boil, cover, reduce heat and simmer until potatoes are done, about 15 minutes. At any time, drop in the reserved asparagus tips and boil for 2 minutes. Remove tips and set aside. When potatoes and asparagus are tender purée in blender, using only as much stock as needed, reserving the rest. Add as much of the remaining stock to get your preferred consistency. The soup can be served hot or made ahead to this point, chilled and served cold. 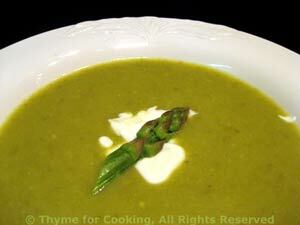 To serve: ladle into soup plates, put 1 tbs yogurt in the center and garnish with asparagus tips.